This web site is actually a non-branded tool for the International School Health Network and its growing list of partners. The many pages in this site provide content that can be embedded and automatically updated in the multiple web sites of our partners, thereby increasing the traffic and refreshing the content for their members and constituencies. We have deliberately kept the pages as simple text, so that partners can drop them into their web sites without interfering with the look and feel of their web sites. We have created pages on different aspects of school-related prevention and promotion as well as on various health/social issues and different types of community and country contexts. Through the use of free, easy-to-use, web tools, we can embed Twitter news/research feeds, shared blogs written by several organizations/authors and wikipedia style collections of resources in multiple web sites and have them updated automatically. If you would like to have any of all of the features described below added to your web site contact info@internationalschoolhealth.org for more information. This page displays a selection of postings (tweets) made through the School Health Insider research, information and news service offered to the members of the International School Health Network. This service clips items from over 250 journals, 150 media outlets, 100 blogs and social media sources and numerous web sites from around the world. 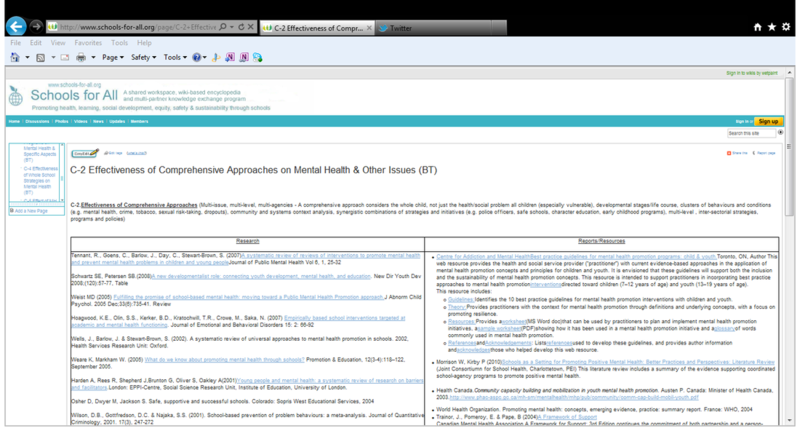 (See the screen shot showing the many features of this service to ISHN members). Various window-style widgets (See the example on the right hand side of this page) can be added to your web site where they will be updated automatically as we post items in the Twitter account on that topic. As seen on the other pages in this small web site, we can customize the feeds to select items on different health topics, SH elements/interventions, regions, countries or different social/economic/cultural contexts. ISHN is working with several organizations and multiple teams of editors and "international discussion groups" to publish a wikipedia style web site that also includes recorded webinars/presentations, shared bookmarks, videos and document collections that have been created by researchers, university students, non-government organizations, officials and practitioners. The World Encyclopedia on School Health, Safety, Equity, Social and Sustainable Development will eventually include material on over 400 topics. We already over 50 topics being developed and several documents. recorded webinars and more produced by over 40 people and funded by several agencies. One of the features of this web site are extensive Bibliographies/Toolboxes that can be embedded in partner web sites, encouraging all of us to add materials as we work on the issues of the day in our own jobs. Take a look at this example of embedding of the international collection on School Mental Health that has been embedded within a Canadian web site. This web site also has a shared blog on all health, safety, equity, social and sustainable development issues as well as specific pages containing blog entries on specific topics or for regions in the world. These blogs articles will be written by selected organizations and writers who will have access to the relevant pages of this web site. As they add a post in this web site, it will automatically appear on their own web site as well as many others. This easy, effective way of sharing insights and information on specific topics such as mental health or on all topics as shown below.